CMS Region IV QI Initiative - Becky Dorner & Associates, Inc. Welcome to the portal for accessing your free CE credits in nutrition and dietetics. Once you’ve completed reading the materials provided on www.cpgltc.org, you may enter here to create an account and access your online tests and certificates. If you are an existing member of the Becky Dorner website, click on the “Member Area” button at the top of this page and log in. 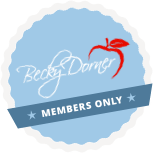 If you are not a member of the Becky Dorner website, click on the “Become a Member” button at the top of this page and sign up for a new account, then log in using the email and password you just created. After logging in, you will be taken to your “Member Area” (your account). In the Member area: Click on the “Tests/Certificates” tab on the left side of the page to access and take the available tests. If you would like to download a copy of the test questions, click on “Partner’s Corner” to find the printable CPE questions you’d like to download.